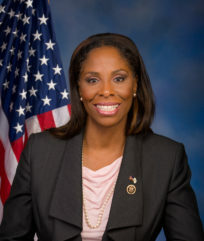 Congresswoman Stacey E. Plaskett is the Delegate to the U.S. House of Representatives from the United States Virgin Island’s at-large congressional district. She is an attorney who has practiced law in New York, Washington DC and the US Virgin Islands. She has thorough knowledge of Caribbean economic development and public-private partnerships for growing the economy of developing areas. As a Freshman Member of Congress, Plaskett is a staunch advocate for poverty-reduction and equal voting rights and has since inspired a new national conversation on poverty and voting rights in U.S. territories. Congresswoman Plaskett is a member of the House Committee on Agriculture and the Committee on Oversight and Government Reform. Since taking office in January 2015, Plaskett has embarked on several legislative initiatives aimed at improving the economy in the U.S. Virgin Islands. She is also an advocate for our servicemen and women and just recently introduced legislation that will help returning veterans secure employment.